TOMMS FACTORY is the product brand name of Haeden Bridge. It includes TOMMS FACTORY Enterprise and TOMMS FACTORY HD Suite, both are strategically engineered to enhance productivity for organizations delivering the most advanced video communication and collaboration services, both economically as well as technically to the users with PC environment. Haeden Bridge delivers CALs(Concurrent user Access License) thatincludes server applications. How TOMMS FACTORY can help organizations improve the productivity? Avada’sBased on company’s patent portfolio, Haeden Bridge is in the position to offer unique technologies that allows TOMMS FACTORY to meet the demands of the management and workforce in organizations. Two-Way IP Multicast Tunneling makes the network efficient. TOMMS FACTORY transmits multicast packets encapsulated in unicast packets which are then decapsulated upon passing through the edge router delivering multicasting packets to everyone without use of any hardware or third party software. This technology saves considerable bandwidth on costly WAN delivering high quality video communication to mass participants. The method of TOMMS FACTORY’s group communication helps organizations establish an economic infrastructure for video communication. Combined with multicast tunneling technology, it support our customers in banking and finance sector for example to have ongoing video communication for various purposes including daily report, general meeting and employee training over limited network across geographically dispersed branches. Multiple Voice Activated Switching(MVAS) saves more but gives more. A simple but smart concept of MVAS minimizes the usage of network bandwidth at both server and participants sides as it shows current speaker and previous speaker which are kept changing. During a large scale webinar in particular, there is no need to see every participant wasting your bandwidth. What you need to see is the speakers with the data they are sharing, and of course it supports two- way interactive communication. Triple Play Service makes your collaboration highly productive. TOMMS FACTORY’s TPS provides the richest user experience delivering real time communication, data sharing and live multimedia broadcasting all at the same time under single user interface. While you communicate, you can instantly broadcast multimedia content saved on your PC, or connect your PC to external devices and stream media images on real-time. TPS expands the boundary of video collaboration beyond “see and talk”. Haeden Bridge has developed the way to deliver an immersive telepresence experience integrating 3D depth sensing technology into video communication. With no use of 3D studio, Blue screen or Chroma-Key, users can set up virtual reality based environment from any desired place on PC. It dramatically improves and strengthen the quality of information delivery during e-Learning, employee training, Webinar and etc. TF Enterprise includes two different modes; Multipoint Web/Video Conference and Two-way interactive Webinar. Users can select the best optimized conferencing mode depending upon situational needs. Multipoint Conference mode of TF Enterprise supports 12 user videos simultaneously with wide ranges of UI layout which is very helpful making your collaboration highly efficient and effective. Two-way interactive webinar delivers the perfect platform for a large-scale service of live event. TF HD Suite provides desktop based Telepresence service. Depending on the device available, the options might vary – 720p or 1080p, single or multiple monitors. 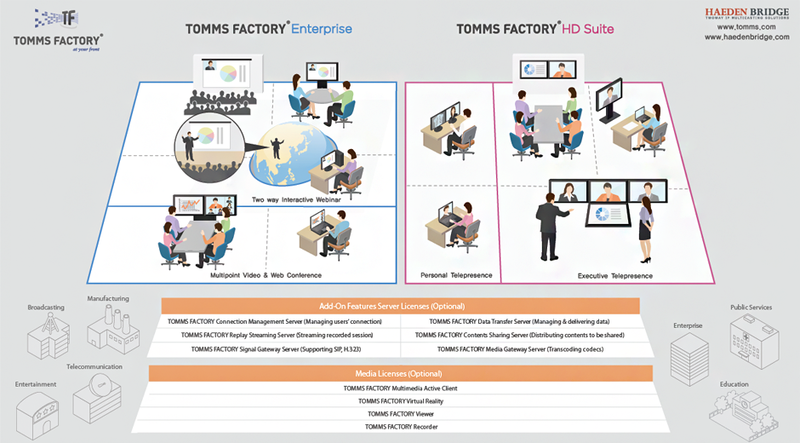 With TOMMS FACTORY HD Suite, you can create variety of telepresence environment fulfilling the requirement from personal to executive.